My name is Marcin Menet and I am the CEO & Founder of GATE Electronics. I have read some unpleasant opinions about our policy with TITAN firmware editions. I would like to explain you why we decided to introduce the firmware editions. First and foremost: we are airsofters and we work for airsofters. We follow your needs and we will do in this case whatever you decide. Since the TITAN V2 release (late 2016) GATE R&D Department is more focused on software than hardware. We employ more programmers than engineers. Of course, we were able to develop main functions for TITAN and stop at that point. Nevertheless, this is not in accordance with our mission. We are still improving TITAN, releasing free firmware and software updates which add new functions and fix bugs. Now the TITAN has it all. All of the improvements users got for free, just making updates. This is because we want to give you new and more advanced functions if only hardware allows for that. There was also a second way to go. The way most companies choose to follow. 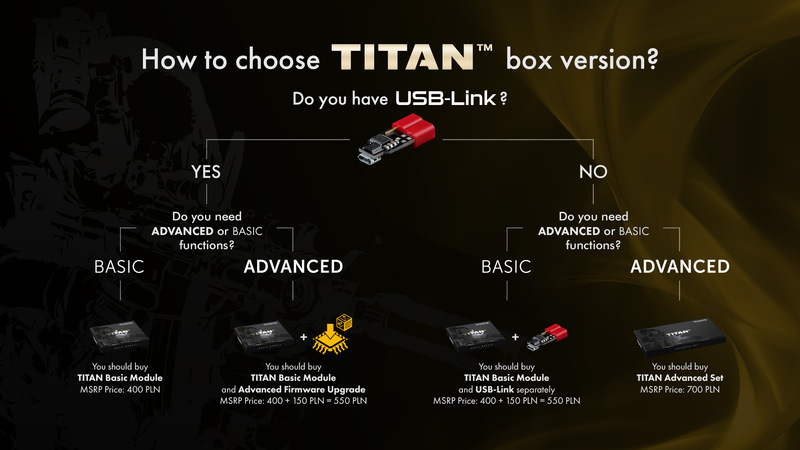 There could be 2 new box versions of TITAN, released year by year with different module colour and new functions, so anyone who would like to have these functions would need to buy another unit, disassemble the gun and assemble again. But we said NO to this idea. Why force user to buy new unit if current hardware of his/her TITAN is able to provide these new functions? Okay, but here is the catch. We are giving free functions for the already sold product, but our R&D has to research & develop them. More functions = more developing = more tests = more problems = more support = more fixed costs. The R&D work did not stop at the day of TITAN release. The amount of work is still increasing, more and more. But maybe there are also some of you who would like to have basic functions and pay less? Or people who would like to have even more functions and pay more for them? Ok, we can do this! First way: Diversification. Simply speaking, what we lose on a BASIC firmware edition, we will get back from EXPERT edition. Second way: Single Advanced firmware edition. No additional functions, no EXPERT firmware edition. In April 2017 we asked you in open survey if you would like to pay less and have simple version of drop-in MOSFET. Many of airsoft players indicated so. The idea was logical and economical. Thus, we decided to answer needs of not only those who want to pay more and have more functions, but also the ones who need simple drop-in mosfet at cheaper price. With the BAE firmware editions, we just answer needs of more customers. All sounds good but why TITAN V2 module with advanced firmware upgrade costs now ~22% more than it cost in 2017? the maintenance of each TITAN's version and GCS App for PC and Android means additional fixed costs. In order to develop new products and efficiently manage the company, we had to take this decision. No matter if we would have introduced BAE firmware editions, the price of TITAN would still increase. We are taking steps to optimize production process so when production costs will drop, we will also lower price of TITANs. There were also “comments” that GATE is making money. Are we making money? Yes. As a company we have to make money. Without making profits, companies cannot develop and go bankrupt. In a big simplification, there are two types of companies: those who are spending most profits to pay their shareholders and those who invest most profits in research & production capabilities. GATE is the company of second type. Our vision is to introduce airsoft into the IOT age and we will do this. We have many ideas how to revolutionize airsoft and the only thing we need is time and your support. So now. Democracy. Let people decide. Below you can find a link to the airsoft survey. One of its questions is about the BAE firmware policy. If the survey will prove that most of you do not want to choose between firmware edition, we will abandon this at the end of 2018. The choice is yours. In the survey, there are also other questions which will help us to develop better products. 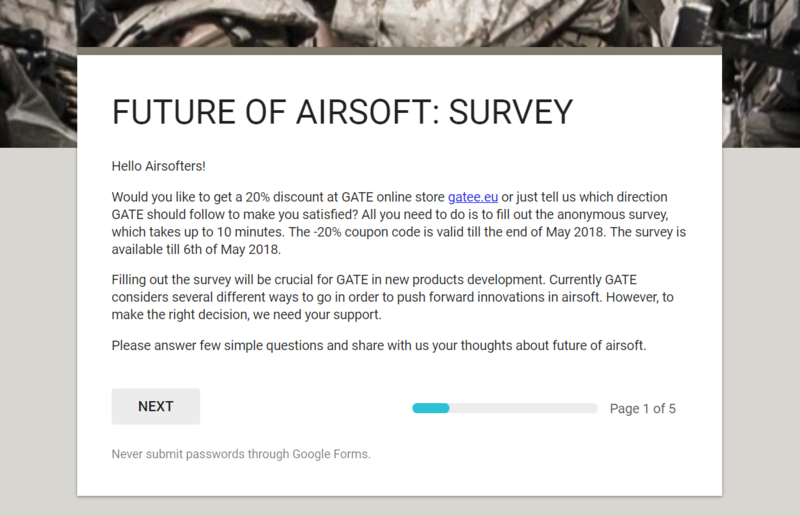 For filling out the survey, you will get a 20% discount for all the products at GATE online store, including firmware upgrades. With best regards. Marcin Menet, GATE CEO & Founder.